Click the centre of the ebook below to view in full screen mode. To view this ebook you need the free Adobe Flash Player. This Sweet Treats recipe book contains 24 delicious dessert and snack recipes that are suitable for anyone on a weight loss diet, or just trying to eat a little healthier. You can buy this ebook now which can be viewed on or download to your tablet or computer. Payments can be made via PayPal or by credit card. After your payment is processed, we'll send you an electronic copy of the recipe book. This book contains 20 of our favourite chicken recipes. These include Cartwheel of Chicken, Spanish Chicken, Dijon Chicken, Risotto, Butter Chicken, Creamy Chicken Pasta, Honey Chicken, Honey Citrus Salad, Chicken Broccoli Bake, Sweet Chicken Curry, & much much more. This is a collection of drink recipes which range from smoothies to juices. Most of these include fruit so they are a great way to tick off your daily fruit intake. 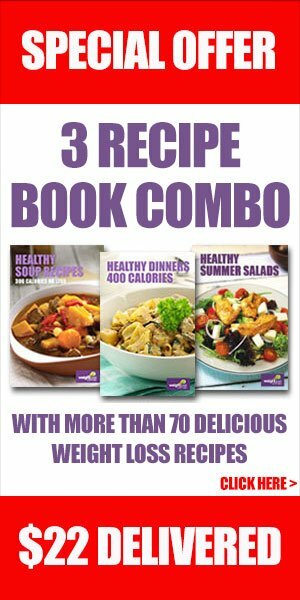 This PDF ebook includes 11 delicious recipes which you can print or save to your tablet or computer. This eBook has a variety of vegetarian recipes including Risotto, Chickpea Burger, Vegetarian Fried Rice, Sweet Potato Bake, Stuffed Tomatoes, Semolina Gnocchi, Frittata, Curry Puffs, Zucchini Bake, Moroccan Tagine. This PDF can be printed or saved to your tablet or computer. This eBook has great muffin recipes which include Apple & Cinnamon, Chocolate & Banana, Banana Almond & Cinnamon, Peach & Blueberry, Pear & Raspberry, Peach & Fig Baby Cakes, Gluten Free Choc Pear, & Banana & Sultana. This PDF can be printed or saved to your tablet or computer. Stir Frys in this eBook include Beef & Vegetable, Sesame Chicken, Beef Chow Mein, Chinese Orange Pork Stir Fry, Thai Chilli Beef, Vietnamese Pork Stir Fry, Beef & Blackbean, Ginger Chicken, Thai Chilli Pork, Vietnamese Chicken Stir Fry. This PDF can be printed or saved to your tablet or computer.